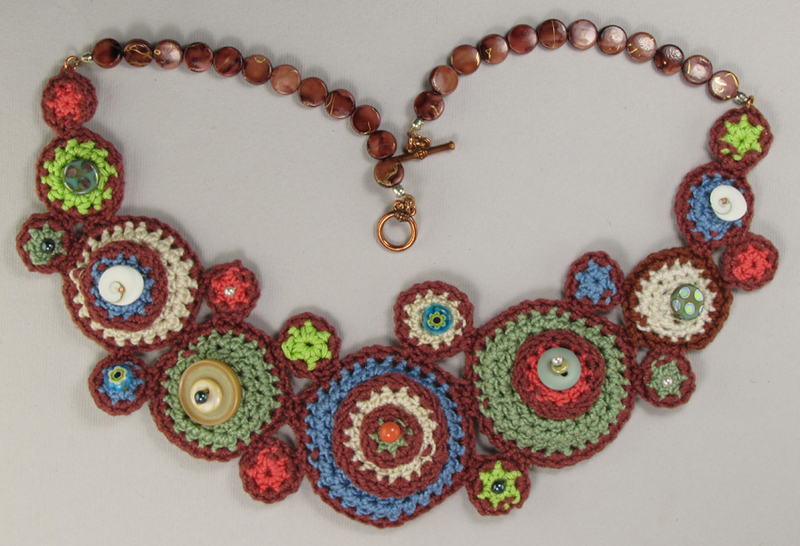 Crocheted jewelry is a beautiful way to wear your art! These examples are all made with crochet thread or similar materials, as well as beads, buttons, and other decorative items. Take a look at these one-of-a-kind creations for some jewelry inspiration! You’ll see throughout this post how many crocheted necklaces are done in circles – often these circles are the result of crocheting around small rings. Or you may crochet a circle from the center our, like in this example. It also uses buttons and beads to add interest and texture. Stacked Crochet Button Necklace Pattern/Tutorial from Etsy shop ljeans. These circles are buttons! They make up the majority of the necklace and are joined by crochet stitches. Crocheted Necklace by Flickr user Fios De linha. 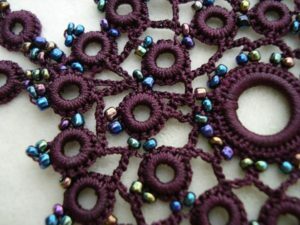 Flowers are also a popular motif in crocheted jewelry. The stones in this photo are bits of sea glass, but the same concept works with any sort of large bead, stone, or gem. 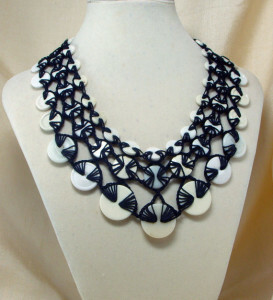 Two layers of crochet give this crocheted necklace some beautiful dimension. Free Form Crocheted Necklace by Myra Wood. Found on FreeFormCrochet.com. 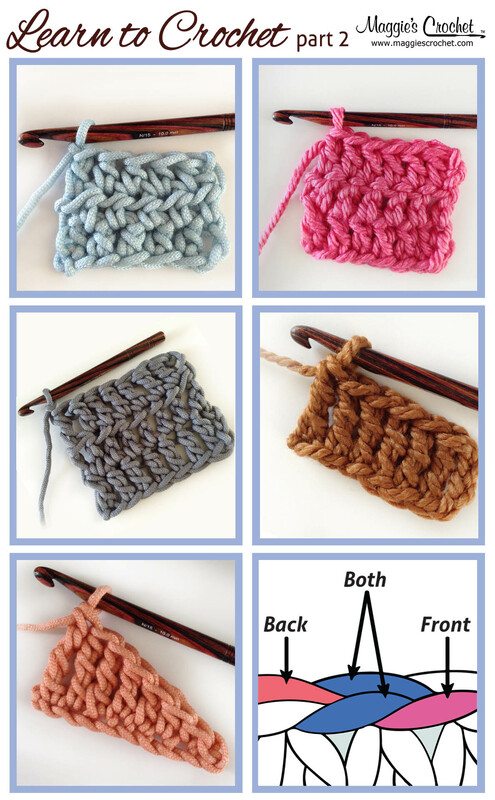 Free form crochet does not use patterns and may be started without an idea of where the end will be! As in the photo, it often utilizes multiple yarn colors and textures in the same piece, as well as unusual and asymmetric shapes. If you’re interested in making your own crocheted jewelry, check out the book Jewelry to Crochet. Its designs are made with cotton crochet thread – we love Lizbeth crochet thread for this and any thread project! It come in nearly a hundred solid and variegated colors, and is available in size 3 or size 10. Love your jewelry need to get busy. Thanks for sharing.